This article is a Review of the Top DRM Video Recorder, we will cover its conversion theory, main features, compatible OS, supported input and output formats, pros and cons, etc. with the intent to help you find the best DRM Video Recorder Guide to get all your iTunes/Digital Copy/Amazon/BBC iPlayer etc. videos DRM free. Digital rights management (DRM) is a class of controversial technologies that are used by hardware manufacturers, publishers, copyright holders, and individuals with the intent to control the use of digital content and devices after sale. And basically there are two kinds of DRM files: iTunes M4V and Digital Copy. Apple uses M4V encode video files, such as TV episodes, movies, and music videos, in its iTunes Store to protect its copyright. To play a protected M4V file, the computer needs to be authorized (using iTunes) with the account that was used to purchase the video. As Digital Copy, it is an extra copy of the movie you bought on Blu-ray/DVD disc that enables you to download or stream your movie to a computer, mobile device, or Internet-connected TV, Blu-ray player or set top box. If your Blu-ray Disc or DVD has the "Digital Copy" logo on the back it will have either a Digital Copy disc inside of the box or a link to a Digital Copy web site. Follow the instructions on the insert inside of your box to redeem your Digital Copy using the disc or the web site. Why need strip off DRM protection? It’s probably that you have downloaded a few purchases from iTunes, Windows Media Center, Zune Marketplace, BBC iPlayer, Amazon Video on Demand, CinemaNow, Blockbuster, Napster, Pandora, Spiralfrog, Bearshare, iMesh, iMeeM, etc, or get some free digital copies of movies with the Blu-rays that you purchased so that you could watch them freely on your smartphone, tablet or computer that is not authorized. But the problem is neither iTunes M4V videos nor Digital Copy movies can be watched on portable devices or other unauthorized computer. You need a Top DRM Removal Tool to free your iTunes M4V videos and Digital Copy movies from DRM protection and you can freely play them anywhere you like. Why choose Pavtube DRM Video Recorder – ChewTune? How to free from DRM protection with Pavtube ChewTune? 1. Open iTunes on your computer, click the Store menu, and then select Authorize This Computer. 2. A window will pop up and prompt you for your Apple ID and password. Fill in the appropriate information, and then click Authorize. 3. After your submission, the whole authorization process completes and now your computer will be authorized for playback. If you have reached your 5 computers limits, you can deauthorize another machine. 1. Insert the Digital Copy disc into your computer’s DVD drive. 2. Wait for the DVD icon to appear on your computer. Do double-click and it will take you to the digital copy interface. 3. Decide whether to transfer Digital Copy to iTunes or Windows Media Player. Note that it requires iTunes 9 or Windows Media Player 11 and later version to download digital copy movies to PC. Here I choose Windows Media Player. 4. Put in the unique Digital Copy redemption/registration code, which you will find on an insert inside of your Blu-ray/DVD packaging. The computer must be connected to the Internet in order for the Digital Copy code to be verified. 5. Choose source movie and target folder to transfer Digital Copy to. Then start syncing movies from Digital Copy to computer. It usually takes less than 5 minutes to download a Digital Copy movie to hard drive. After Digital Copy transfer completed, the movie can be played instantly with Windows Media Player. 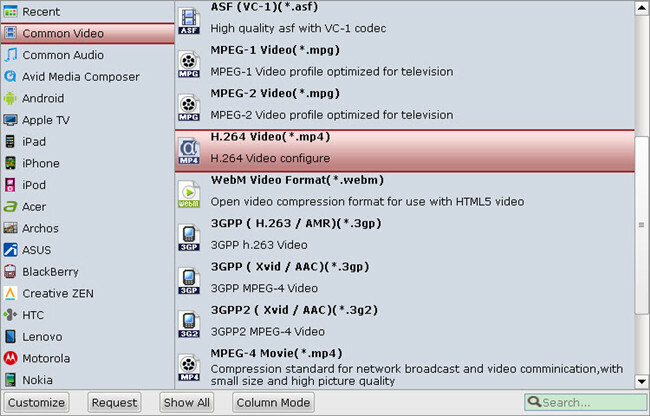 Run Pavtube DRM Video Recorder, drag and drop the source DRM video from local computer to ChewTune. Or hit the “Add Video” button to import your iTunes, Amazon, or Digital Copy, etc. Pavtube ChewTune includes various profiles under “Format” list and you could always find the optimized one for your need. Meanwhile, you can enter “Settings” option to adjust profile parameters, such as video codec, bitrate, frame rate, size, etc to get better video and audio quality. Click the “Convert” button on software main UI to start recording DRM video. When it completes, click the “Open” icon to locate the DRM-free movie, and transfer it from PC to anywhere you like for playback. 1. To ensure the stability of Pavtube ChewTune trial version, make sure you have turned off iTunes before running this app. 2. Because of 1:1 video recording, it takes as long as the source movie length to finish the whole ChewTune DRM-free process, it’s better to select a small sample video for testing. 3. Since Pavtube ChewTune supports batch processing facility, you could import more than one DRM videos and run overnight, and you would get all videos recorded the next morning. Don’t forget to set up Windows power options to never turn off monitor or never let the computer system standby.